Without exercise, our hearts stop working as well, we put on extra layers of fat, and various other health issues become a problem. Dogs, cats, and other animals have the same problem. So, what do you do for a guinea pig or rabbit? It’s a bit hard to take a hamster on a leash for a jog. That’s where pet playpens come in handy. These awesome playpens are perfect for any of your small pets. Rabbits, guinea pigs, hamsters, small dogs, even ferrets will do great in these. This fantastic playpen is perfect for either indoor or outdoor use. We highly recommend getting the cover and mat to help keep your playpen area even more secure. The durable construction makes it easy to feel safe with your piggy, ferret, dog, or even hamster running around safely. Best of all, you won’t need any tools to put the Marshall Small Animal Play Pen together. You can set it up in seconds, and easily transfer your fuzzy friend to a safe space to play or hang out while you clean her cage. This simple pet playpen is easy to set up and tear down. It’s a simple series of metal wire panels, and is specifically designed for smaller animals like hamsters, guinea pigs, and chinchillas. 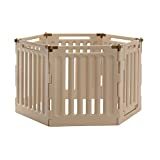 This playpen will allow your furry friend the chance to run and play in 9 square feet of space, with secure walls keeping him from wandering off. The coating on the Midwest Small Pet Playpen is designed for indoor and outdoor use alike. If your critter loves going out with you, this is the perfect way to give him some fresh air, while staying safe. The Ware Pop Up Playpen is another fantastic pet playpen. This one easily folds away and comes with a mesh top that helps keep your hop-happy critters more secure than some models may do. With a lot of mesh spaces, including the top cover, this soft-sided pop up playpen is great for pets who get antsy in exposed spaces. The Iris Exercise Pet Pen comes with either 4 panels or 8. You can easily set up this playpen for your pooch, your bunny, or your guinea pig that needs some roaming room. The 8 panel kit provides 21 square feet of playpen, while the 4 panel playpen gives 8 square feet of play space. The smaller version is perfect for guinea pigs that need to run around a bit, while the larger model is great for small dogs and rabbits who need a bit more space for running. 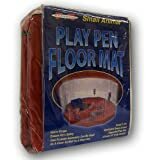 This playpen is durable plastic, so it’s great for indoor or outdoor use. The Trixie Soft Sided Mobile Pet Play Pen is one of the most versatile small animal playpens available. It’s great for travel or moving your pet’s playpen for cleaning. The Trixie is sturdy enough to use every day, and folds down to a nearly flat mesh square. This makes for easy storage when playtime is up. The top edges of the Trixie Soft Sided Mobile Pet Play Pen gently curve over, to help keep extra energetic animals from jumping over the edge. Small dogs love this extremely flexible playpen. Well, we should say owners of small dogs do. 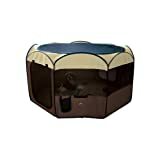 This convertible dog and small pet playpen works as a play area, as well as a pet barrier to help keep Fido and Hoppy out of harm’s way. This sturdy plastic barrier or playpen sets up easily, and easily expands from the pen to a room divider, or pet gate to keep Fido separated from the crowd during a party. 14" high sides provide for secure and convenient access to Guinea Pigs. Great for indoor or outdoor use. This fantastic playpen is designed just for guinea pigs. It’s got a soft bottom mat, which makes clean up super easy when it’s time to call it a night. Because of the design, it’s super easy to connect other playpen kits to create a larger play area for your piggies, if it seems like they need more space. That’s a major reason we love this guinea pig playpen. It’s super easy to set up, even easier to maintain, and easy to clean. There are easy to use ramps that connect between pens, adding adventure and play for your piggy’s day. As you shop for a playpen for your guinea pig or other small pet, remember to make sure that the playpen will work wherever you need it, stores away easily between playtimes, and is easy to set up again. Make it easy on yourself, and you’ll both enjoy exercise time a lot more.